I am not sure what it is about spring, but every time it rolls around I find myself once again thinking about green risottos. Given the asparagus binge that I have been on the last few weeks and asparagus risotto was going to make an appearance sooner or later and this weekend it happened. I stuck with a pretty basic risotto recipe and added the asparagus in a few different ways. First off, I replace some of the chicken stock with the water that I cooked the asparagus in to make sure that I did not loose any of those nutrients. Asparagus has a wonderful juicy texture that I did not want to miss out on so I had to include some bite sized pieces and finally, I wanted to add a bit of green to the risotto itself so I pureed half of the asparagus in a food processor before mixing it in. 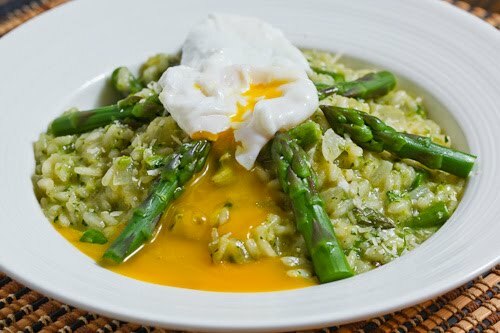 Risotto works equally well as a side dish or as a main if you add a bit of protein and with all of the asparagus and egg combinations that I have been doing lately the first thing that came to mind was topping the asparagus risotto off with poached egg. The juicy asparagus worked really well in the creamy and cheesy risotto with the flavour of the asparagus pairing nicely with the flavour of the parmigiano reggiano. Of course the egg yolk running all over everything only made it better! Another great way to enjoy some fresh asparagus in a light spring meal! Mix in the parmigiano reggiano and butter and stir until melted. Remove from heat and mix in the lemon and the asparagus. Crack an egg into a bowl and pour the egg from the bowl into the water. Repeat for the remaining eggs. Split the risotto among 4 plates and top with the poached eggs. Most of your recipes are a slight variant of the last. Doesn't that go against your bio "I came to realize that my meals were boring and that I had been eating the same few dishes over and over again for years"? What's tomorrow, an asparagus grilled cheese with a poached egg? And queue in Rosa's Yummy Yums who will have nothing of interest to say except "Looks delicious! Cheers, Visit My Website!" Love the puddle of egg yolk, I like an egg yolk to burst in my mouth though……spring time delux! I have seen so many delicious asparagus recipes recently…I love the. Actually, George, they are usually a slight variation of recipes involving that particular ingredient of the week or two weeks. He usually seems to pick ingredients based on what is in season. Yes, a sandwich will always just be a sandwich, and a pasta dish will always just be a pasta dish, etc etc, but putting in different sets of ingredients still makes them different meals. As opposed to eating a strictly grilled cheese sandwich or strictly spaghetti every week. What a splendid dish! Very sunny and so good looking! There are two billion other cooking blogs if you look around..Why are you on this one if you think it's boring? I,for one,love the slight variations offered..there's something for everyone..And if this is not your kind of thing,then just click your way to another blog,babe! I'm beginning to think you could top just about anything with a poached egg and it would be delicious. Great dish. And George. If you don't have anything nice to say then don't say anything at all. No one is forcing you to read this blog. I really love a seasonal risotto. Adding a poached egg really makes a meal out of it Kevin. on risotto…what an original idea. it looks delicious in the pic. That poached egg looks PERFECT. I've been known to top almost anything with a poached egg – but not risotto. What have I been missing!?!?! Looks wonderful! I've used more recipes from your blog than any other blog I follow. I added garlic scapes to this risotto for dinner tonight and it was delicious. Thanks for the inspiration! It was sort of unclear to me how exactly we were supposed to cook the asparagus (I searched a few of your recipes, and now assume that you boil water and stick the asparagus in for about two minutes until they turn dark green), but I think it would be helpful if you include that kind of thing. I (love and) read this blog all the time, and I have found this to be somewhat of an issue. I typed up another comment, but google decided to eat it in its lust for me to switch accounts. Over the year(s?) I've been reading, I've noticed this problem. I know it is probably onerous for you to have to type up those kinds of things, but they are very helpful!! Thanks for keeping this awesome blog. Ariel Farrar: Yes, just throw the asparagus into some boiling water and cook until they turn dark green,nor more than a minute or two. To keep the dark green colour you can throw them in cold water to stop the cooking process after you pull them off the heat. You can cut the asparagus before or after cooking. Very good idea. I really liked the poached egg with the risotto. I have added more liquid to get the right cooking. 2 cups was not enough. Thank you for all the great ideas on Facebook. Sophie: I am glad that you like it! 2 cups of broth plus 1/2 cup of wine should be right but keep adding broth until you get it to the consistency that you desire. can the eggs be poached in the risotto? You could create small holes/indents for the eggs in the risotto, place the eggs in them, and bake them until cooked!